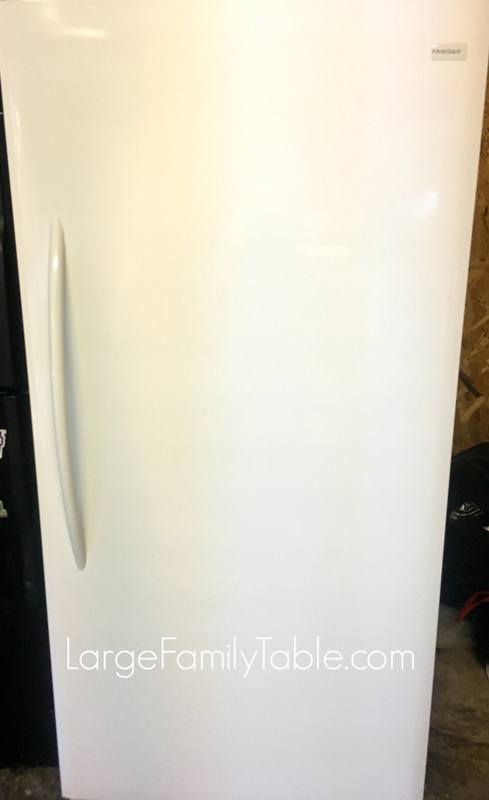 Several years ago I bought a used upright freezer and a used refrigerator from a neighbor’s yard sale for around $150. 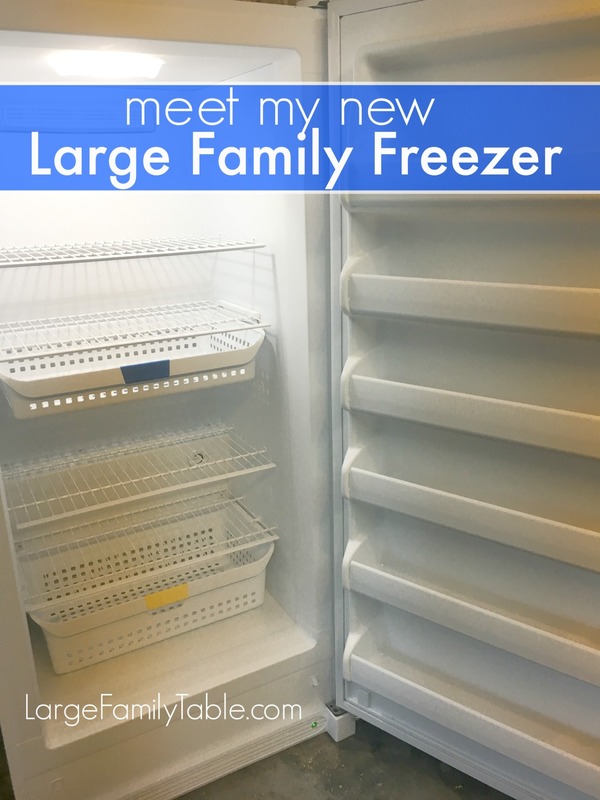 Right before we moved in 2016, the upright large family freezer died on us after about two years. And just a few weeks ago, after close to three years, the used refrigerator officially gave up being a part of our family, too. This put our growing large family down from what once were three refrigerators and an upright freezer to just two refrigerators. With all of my bulk large family grocery shopping, the idea of only two refrigerators was unbearable. I say this because we live in the wilderness, homeschool a herd, run a business from home, and getting to the store even biweekly can be a hassle for us. Plus, I’ve wanted to get back into freezer cooking. I’ve managed a few large family style freezer cooking days since our move. I could pull this off by utilizing the upper freezer space in the then three refrigerators. But I longed for the days of an upright freezer full of freezer meals ready-to-go! Since I’m in my 3rd trimester of pregnancy many things seem to irritate me at the moment (oh, the hormonal honesty, friend). I didn’t feel like working Facebook sale groups or Craigslist for a used refrigerator and used upright freezer deal. I also decided what I needed more than a 3rd refrigerator is a new full-size freezer. Maybe after Benjamin David is born, I’ll feel all the feels of working for a used fridge deal. I asked moms on the Large Family Table Facebook page to see what their best tips were for buying a new large family freezer. Several moms suggested buying a freezer model with an alarm and a lock. These are both features I wouldn’t have known to look for otherwise. 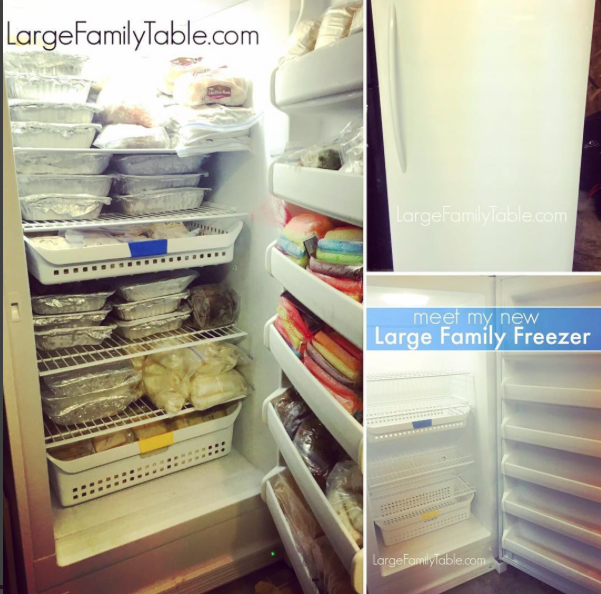 What’s fun about this Facebook freezer thread is several moms share pictures of their large family freezers, too! This is the exact upright freezer model I ended up ordering. It’s a 20.2 cu ft frost free upright model. It does have the freezer lock (Lord, help me not lose that key! ), but didn’t come with an alarm. Here is my Amazon affiliate link to see several freezer alarm options if you’re interested. I still haven’t decided if I’m getting an alarm or not. Let me know if you have one! I do like the lock feature though. I see kiddos often trying to open the freezer just to see what’s in there. 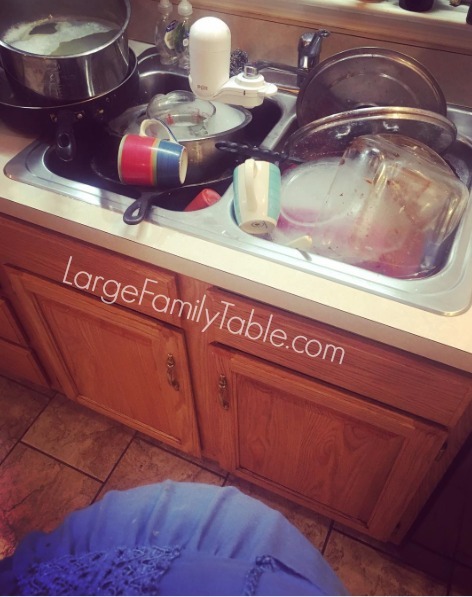 Currently, I have it crammed with large family style freezer meals (those posts are coming! ), and popsicles are stashed in there as well. If it wasn’t for the lock, I bet it would be left open by those curious kiddos. 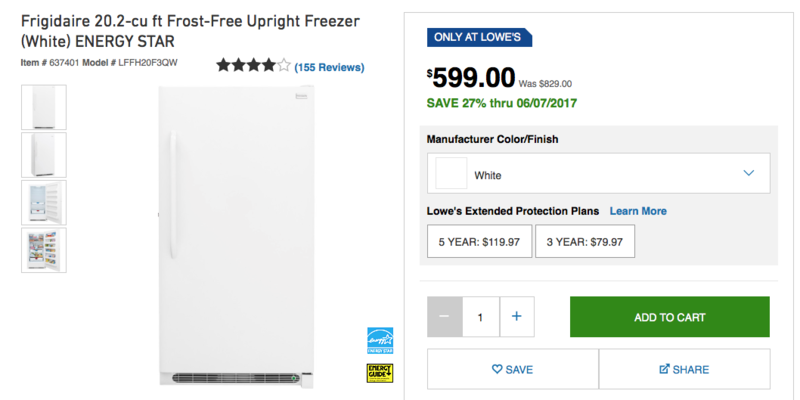 The original price of this freezer was $829.00. I was able to purchase it for right around the current (as of today’s posting date) price of $599. I also paid an additional $15 for our dead used refrigerator’s removal. The only slight problem I had with Lowe’s delivery is I expected and was told on the website that the freezer could have delivery within 24 hours. I didn’t put my order in until Sunday evening, so I figured the transaction might not be placed until Monday. This could make my delivery time look more like Tuesday, which I was fine with accepting. Much to my surprise, I received an email early Tuesday morning saying my delivery was scheduled for Friday, over 5-days after my order’s placement. This was shocking because when I ordered, I saw there were five models in my local store, and I chose the option for “Delivery available as soon as tomorrow!” In my mega food management world, this was a big deal because I had my first huge once-a-month online Walmart grocery pick up scheduled for that same Friday. I needed the new freezer cold and ready for our huge grocery haul, instead of waiting for the freezer delivery. I put my pregnancy hormones in check after a few moments of mental panic and called the Lowe’s helpline. The customer service was fast and very understanding, even at 7 a.m. She rescheduled the delivery for the following day, which was Wednesday. Still not the 24-hour turnaround time from my order, but certainly better than Friday. The delivery crew was very efficient. They set the new freezer up, made sure it was level and working properly, installed my door handle, etc. And, drum roll, above is a recent picture of the new freezer fully stocked with sanity-saving freezer meals. As I’ll share shortly, I took two days and did well over 40 large family freezer meals (many for the oven and several for the slow cooker). And we can’t forget the 100 PBJs, 100 grilled cheese (not pre-cooked, but ready for the griddle), 100 Egg/Cheese Breakfast Burritos, many loaves of specialty fruit loaves of bread, french toast and more. I also froze precooked chicken breast and precooked ground beef to have on hand, several pounds of beans, brown rice, and mixed season veggie packs consisting of onions and various peppers. Needless to say, the new freezer and I are getting to know one another very well! It’s over 4-weeks since these massive freezer cooking days. It has been such a blessing to have a packed freezer that is *still* pretty full almost a month later. 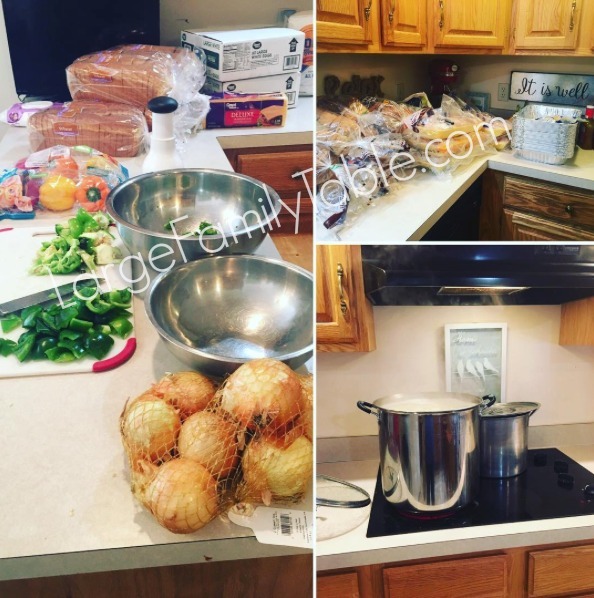 I’ll share my first online Walmart grocery order and a full breakdown of these freezer cooking days complete with my recipes and tips to help pull it all together. I’m of course working on 3rd trimester time these days. 🙂 You can also watch a tour of the new freezer here. Let’s chat freezers in the comments below! We still have an one that came with our old house. 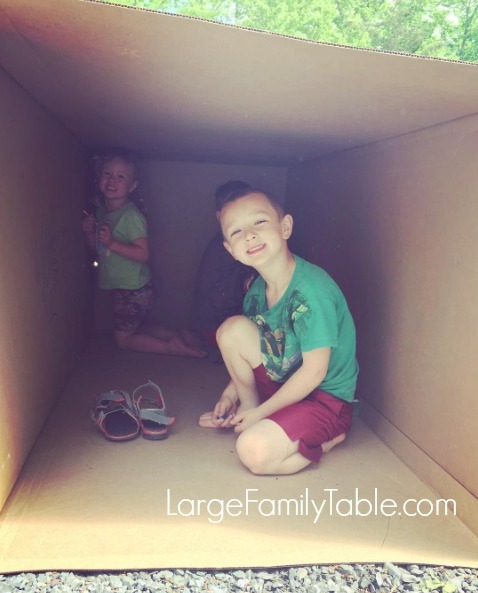 I would like to start using this more efficiently since the small side by freezer is getting small and we are only a family of 4 (2 boys that eat like teenagers that are 10 and 7! 🙂 ) This is inspiring me to do more freezer meals and use my freezer more then I do now. Wow! 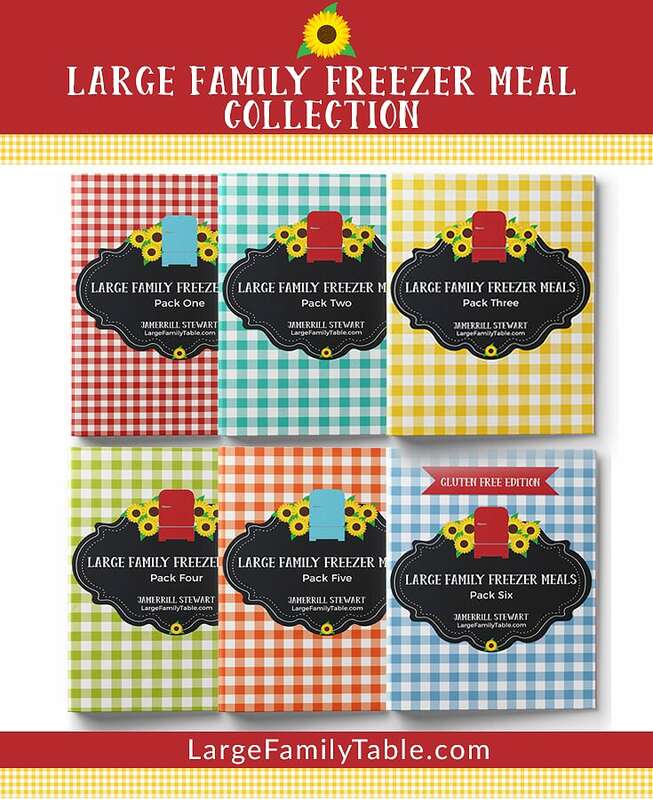 That is a lot of freezer meals! Great work Mama! We just purchased a third deep freeze for our camper. We are in the process of moving into our camper full time for the next year or so and with a large family, that just wouldn’t work without a large freezer. Oh wow, a year in the camper full time sounds like fun! I’m curious where you keep the freezers? Under the seats? Underneath in storage? Wow! 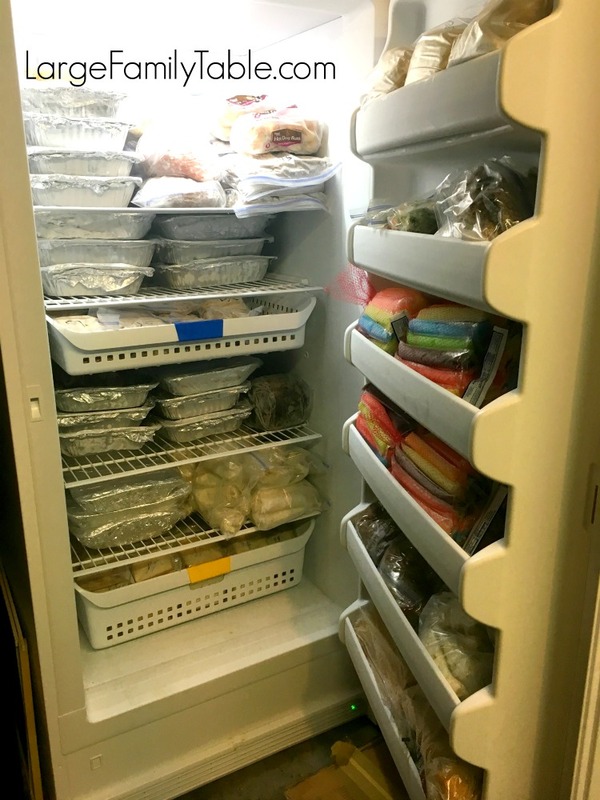 The photo of your packed freezer is AMAZING! Totally inspirational, too! We go up to the lake in Maine each summer for several weeks (my husband’s family’s cottage- he is a pastor and getting away for several weeks is a huge priority for us to rest, unwind, unplug and be refreshed) I am currently trying to do the “eat your freezer and pantry down” challenge! 🙂 Then when we get back I want to do a lot of freezer meals and re-stock. I do a lot of the same freezer meals as well ! It has been a life saver for me ! I also do crockpot freezer meals too . We only have a small chest freezer and 2 small fridges…. BUT we want to get an upright freezer too . That is so we can utilize more freezer meals . Can’t wait for more up coming videos on freezer cooking . ??? A dear friend of mine attached her freezer key to the top of her upright freezer with a magnet, I think? It was some kind of magnetic key holder, like what you can purchase to stash a spare car key under your bumper. I have no idea where she bought it, but I bet you could look at an auto store or probably Amazon. It kept the key out of reach of her kids, but handy for her to access easily.